Those who are still struggling to make their first billion dollars can afford to feel smug for a moment. 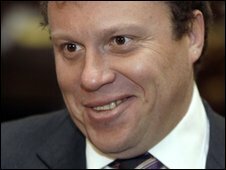 Billionaire businessman Sergei Polonsky once declared that anybody in his native Russia who failed to make at least $1bn was "a loser". But that was before his Mirax Group company's assets were frozen by a court for failing to repay a $242m loan. Mr Polonsky blames the recession, which he urged reporters not to blow out of proportion late last year. Mirax is "struggling with the storming seas of the economic crisis," he writes on his blog. "During the past year, we haven't managed to get a single loan for construction, and in the past month we haven't sold a single square metre of housing or collected any instalment payments for the real estate we've already sold," he continues. Mirax owes the $242m to Alfa Bank, which obtained a ruling in the Moscow Arbitration Court last week to freeze the firm's assets. Mr Polonsky, the company's chief executive, was valued at $1.2bn by Forbes magazine last year. He says the group will now cease all construction. One of its most famous projects is the Federation Tower skyscraper in Moscow, which was due to open in 2010.